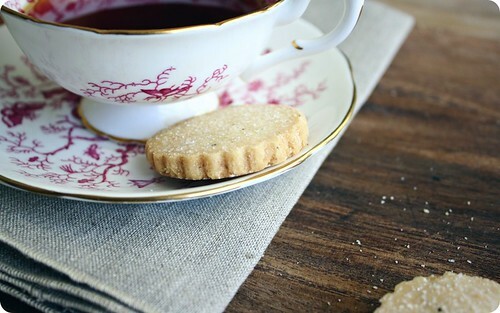 It began with sunlight and ended up with shortbread. Most mornings, the front room of our house is quiet. As a family we prefer to cluster around the kitchen in those first minutes of the day, in sock feet and pajamas, mulling around the coffee maker and the kitchen table. The other day I was drawn out of that comforting circle of domesticity by the wayward ramblings of our youngest, whose well-loved train set resides in the room closest to the front of our home. And upon our arrival to that room, it was evident I had been missing out. The leaves on our trees are only coming into their foliage now; they're still a tangle of branch and lacy beginnings of leaf. The first light of the morning isn't blocked, but delicately filtered through this doily of green, shining golden against the wall opposite our windows - on now on that wall, three projected rectangles that flickered with the shadows of a thousand butterflies. Later that same day, we were in the backyard when our eldest implored me to look up - something adults often forget to do, but children seem to do all the time - he was pointing out the white chalk line of an airplane as it travelled across the sky. If you face the sun like that, even through trees, your cheeks grow warm and when you close your eyes it's like you're looking at fireworks through a kaleidoscope. Maybe it was all this time staring at the sun, but that day I was seeing the world through dandelion-coloured glasses. So when it came to an afternoon snack, shortbread fit the bill. Weeks ago, Shari had talked about a version she'd tried that was speckled with rosemary. I'd bookmarked a promising recipe from Gourmet that same day, but not gotten around to trying it yet. And oh boy, was I missing out when it comes to shortbread, too. Pale yellow from generous quantities of butter and a of squeeze ochre-hued honey, this is a cookie that yields to the tooth but lingers on the tongue. They look comparatively plain, slightly sandy and crumbly at their edge and with the only the suggestion of a puff at their centres. 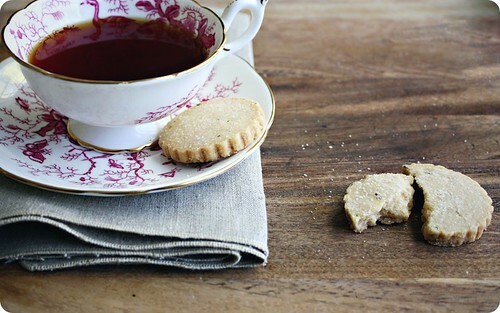 But never mind their looks, the simplest of shortbreads are often the best in my books. To make these is to make most biscuity cookies, sugar and butter are creamed with the honey, then dry ingredients are added to that. It's not a dough that likes to be bothered; as soon as all the flour is dampened by the fat, it's all tipped out onto a board and kneaded together. Pat it gently into your desired shapes, dust them with sugar, then off to the oven for baking. They are fine and sweet and a little bit savoury with flakes of salt and that resiney, piney taste of rosemary that pairs so well with honey. I think some lemon zest might be a possibility to explore, but only out of curiosity and not necessity, as they are not in any way in want of improvement. As far as I can tell, it is the cookie for a spring afternoon. One full of sunshine, if that can be arranged. Recipe from Gourmet magazine, via Epicurious. The recipe specifies a mild honey, however I used a more robust variety which resulted in a pronounced, honeyed flavour to the baked cookie. I only had enough fresh rosemary on hand to amount to 2 chopped teaspoons rather than the required 1 tablespoon. I found the lesser quantity suited my taste. For added texture and a satisfying salinity, I used sea salt. I'm working on re-establishing those words, but in the interim, I wanted to say thanks. Really, I don't have a way to fully convey my gratitude - to all of you who have read, for all of you who wrote back then and who write now. My old stories seem so lonely without your presence, and it illustrates what makes this site mean so much to me. The conversation, that's the thing. And without you, it's gone. So, again, five years on, thank you.